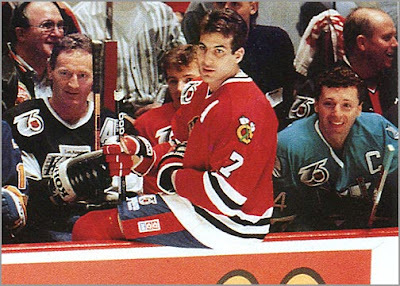 Last week, the Chicago Blackhawks honored former player and legend Chris Chelios with a pregame ceremony. Chelios retired in August, capping off a remarkable 27-year professional career that spanned from 1984 to 2010. 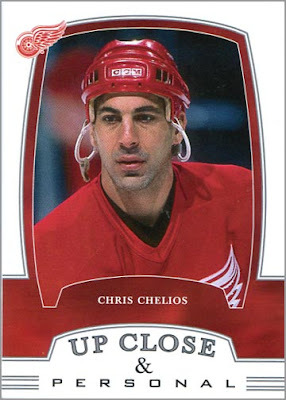 Chelios is my all-time favorite player. A defensive stalwart, he could help offensively too. He was rugged and would fight. 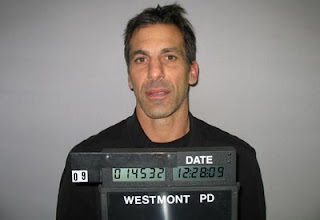 Seemingly, there wasn’t anything Chelios couldn’t do…except take a night off. The man never quit, even when he was well into his forties and twice as old as many of the men he was playing against. Now that Cheli has retired–or more appropriately, now that I have come to grips with his retirement–I thought it would be a good time to take a look back at his career…but with rectangular pieces of cardboard as the visuals. Get comfortable…this is gonna take a while. 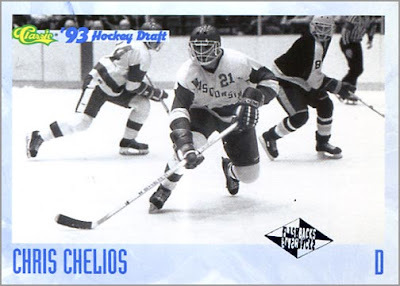 1981-82 & 1982-83 – Chelios played college hockey for the University of Wisconsin (WCHA). In his first season of college hockey, Chelios was named the league’s rookie of the year. In his second season, he was named both a Second Team All-Star and to the All-Tournament Team. 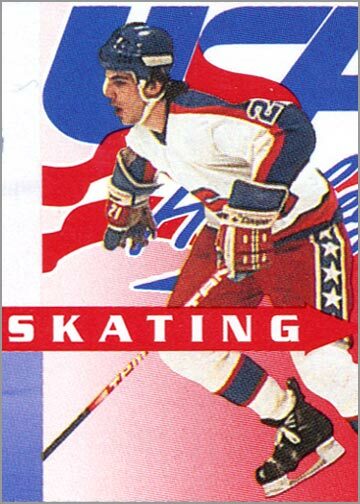 1984 Winter Olympics – Chelios played for the United States Olympic Team, skating alongside future NHLers Pat Lafontaine, Ed Olczyk and Al Iafrate. After the Olympics, Chelios turned pro. 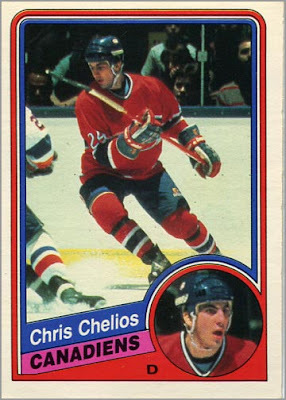 End of the 1983-84 season – Chelios made his NHL debut on March 8, 1984. 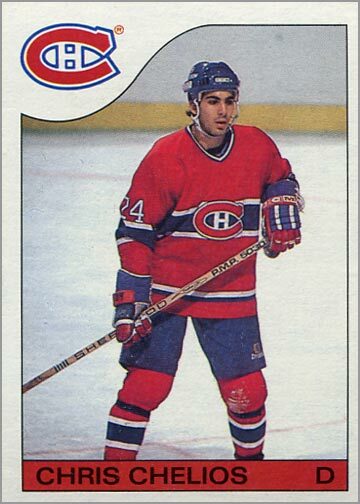 He played in 12 regular season games and 16 playoff games for the Montreal Canadiens. September 1984 – Although he was still considered a rookie by NHL standards, Chelios was good enough to play for Team USA in the Canada Cup tournament. 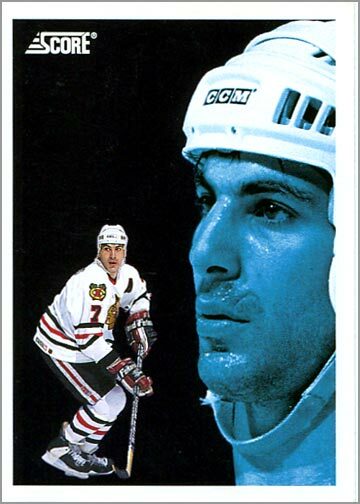 1984-85 – In his first full season in the NHL, Chelios would appear in the NHL All-Star Game and was named to the NHL All-Rookie Team. He was the Calder Trophy runner-up to Mario Lemieux. With 64 points, Chelios led all Montreal defenders in scoring. 1985-86 – Chelios won his first Stanley Cup Championship with the Montreal Canadiens. 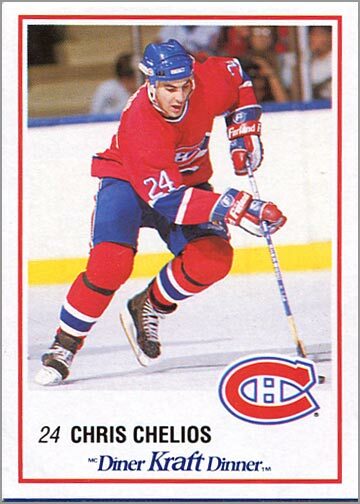 1986-87 – In his third full season, Chelios represented the NHL in the Rendez-vous ’87, a two-game series that replaced the All-Star Game. 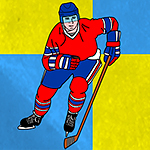 The tournament pitted the best NHL players against the best Soviet Union players. September 1987 – Chelios played for Team USA in the Canada Cup Tournament. 1987-88 – Chelios was again was the top scoring defenseman for the Montreal Canadiens with 61 points. 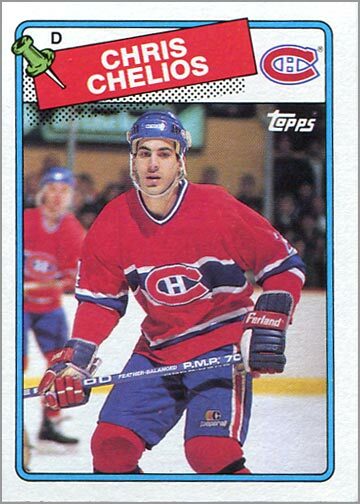 1988-89 – Chelios was the top-scoring d-man on Montreal a third time. He won his first Norris Trophy as the NHL’s best defenseman and was named a First Team All-Star. 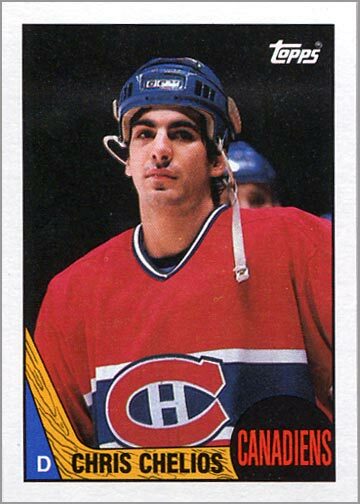 1989-90 – Chelios was named co-captain of the Montreal Canadiens. In an injury-shortened season, he would still play in his second All-Star Game. 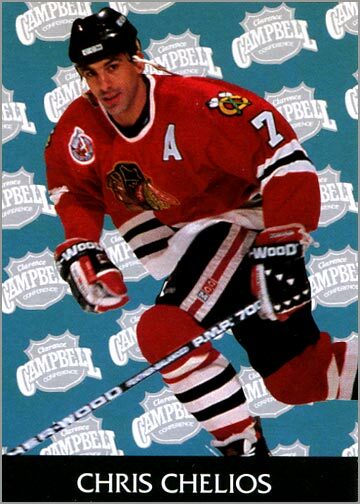 1990-91 – In Chelios’ first season with the Blackhawks, he was voted as a starter in the 1991 NHL All-Star Game, which was held in Chicago. He was also named a Second Team All-Star, was the top scorer among Chicago defenseman and helped the team to a first-overall finish with 106 points. 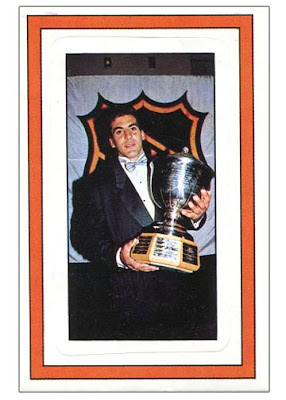 September 1991 – Chelios played in his third Canada Cup, and was named to the tournament’s All-Star Team. 1991-92 – Chelios would again be named a starter in the NHL All-Star Game. For a second season in a row, he would top all Chicago defenseman in scoring. 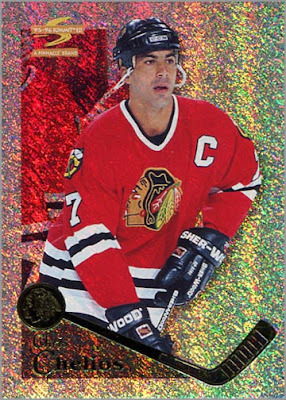 1992-93 – The 1992-93 season was one of Chelios’ best. He was second overall in team scoring with 73 points and won his second Norris Trophy as the NHL’s best defenseman. He was voted a starter in the NHL All-Star Game, and was named a First-Team All-Star at season’s end. 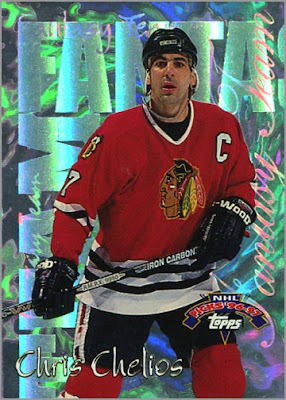 1993-94 – In his fourth season with the Blackhawks, Chelios was voted as a starter in the NHL All-Star Game for a fourth consecutive time. He’d also finish third on the team in scoring, with 60 points. 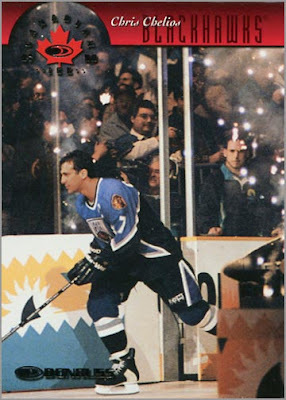 Fall 1994 – The 1994-95 season was delayed by a 103-day lockout. During that time, Chelios played in an NHLPA-sponsored “4-on-4” charity tournament. He also played for Biel in the Swiss-A League. 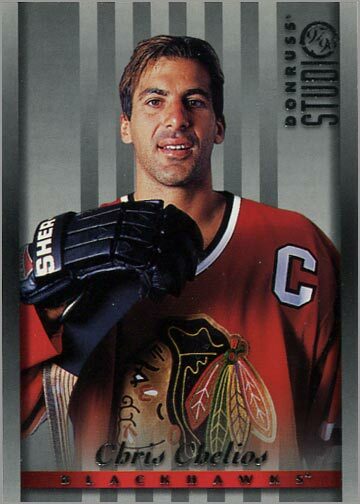 1995 – There was no All-Star Game during the lockout-shortened 1994-95 season, but Chelios would score 33 points in 48 games and was named a First Team All-Star. 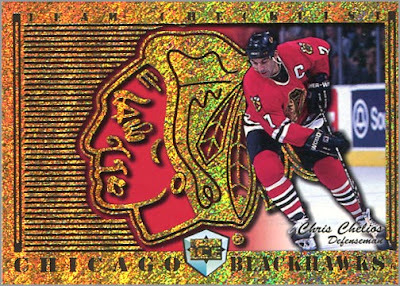 1995-96 – It was another standout year for Chris Chelios. He was named the Blackhawks team captain. He also led the team in scoring with 72 points. For a fifth consecutive time, he was voted as a starter in the NHL All-Star Game. At the end of the season, he was named a First Team All-Star and was awarded the Norris Trophy as the league’s top d-man. 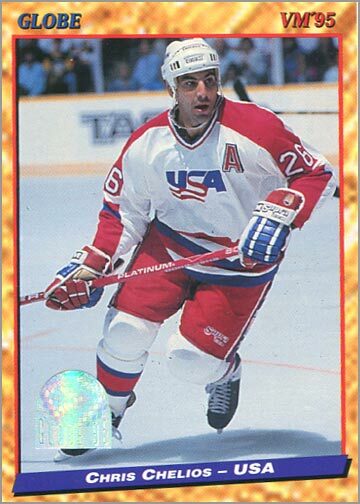 September 1996 – Chelios represented the United States in the first World Cup of Hockey, helping Team USA win the gold medal. He was also named to the tournament’s All-Star team. 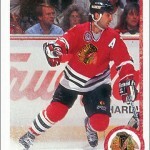 1996-97 – Chelios topped all Chicago defenseman with 48 points. For the sixth time in a row, he is voted as a starter in the All-Star Game, and serves as the captain of the Western Conference team. He is also named a Second Team All-Star at season’s end. 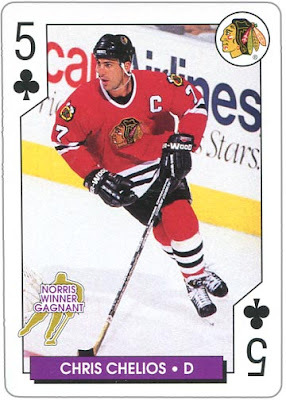 1997-98 – For the first time in 28 years, the Chicago Blackhawks would miss the playoffs. 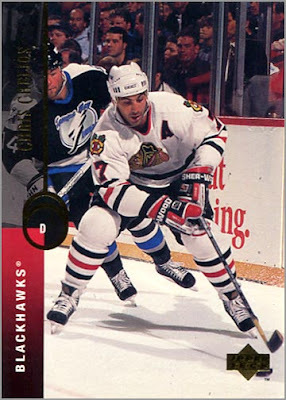 Still, Chelios would continue to be one of the bright spots for the ‘Hawks. 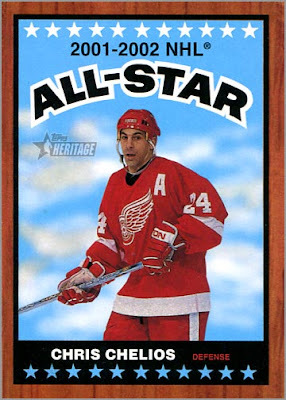 Though not a starter, Chelios played in his 8th consecutive All-Star Game. 1998 Winter Olympics – During the Winter Olympics, he was the team captain for the United States. 1998-99 – This was the last year Chelios played for the Blackhawks. From what I recollect, Chelios wanted to play 2 more years then retire as a Blackhawks. But the ‘Hawks had no intention of re-signing him, and traded him away. 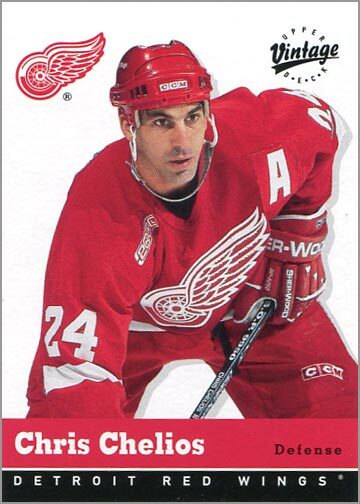 March 23, 1999 – Chris Chelios was traded to the Detroit Red Wing for Anders Eriksson and two 1st round draft picks. 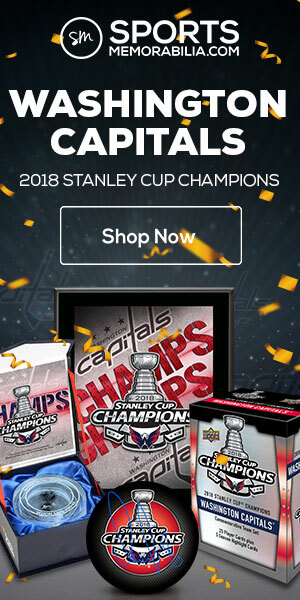 At this point,I stopped being a Blackhawks fan for a long time. 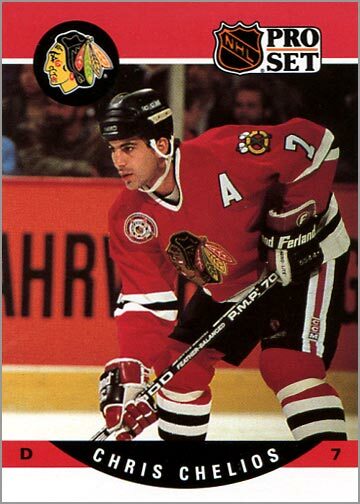 My favorite player of all-time–the heart-and-soul of the team–was traded to the ‘Hawks biggest rival. 1998-99 (continued) -Chelios is now with the Red Wings. 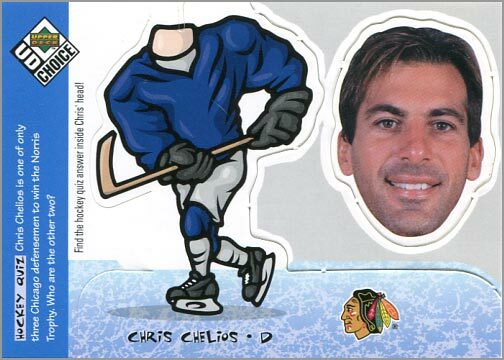 Most people thought that he’d “hang ’em up” after another season or two…but Cheli had other ideas. 1999-2000 – Chelios plays in the All-Star Game for the 10th time. Though no longer the “go-to” guy he was with the Blackhawks, Chelios puts up a respectable 34 points. 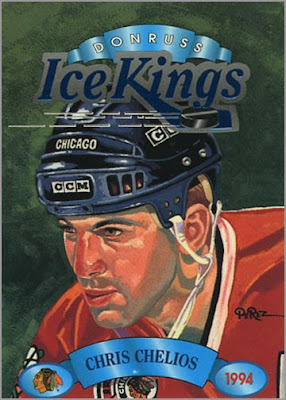 He still played with an edge–his 103 penalty minutes were 3rd on the team. 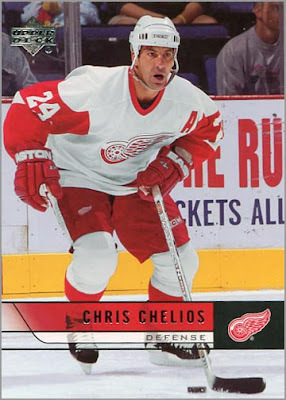 2000-01 – Injuries would limit Chelios to 24 games. 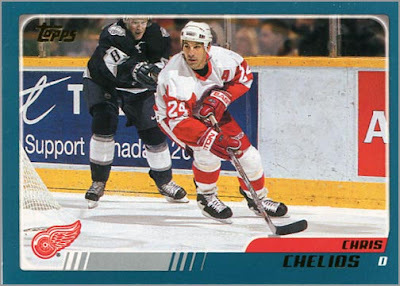 2001-02 – Cheli would experience a career renaissance during the 2001-02 season. He appeared in his 11th (and final) All-Star Game. Afterward, the NHL would go on hiatus for the 2002 Olympics. 2002 Winter Olympics – Again, Chelios would captain Team USA in the Winter Olympic Games. 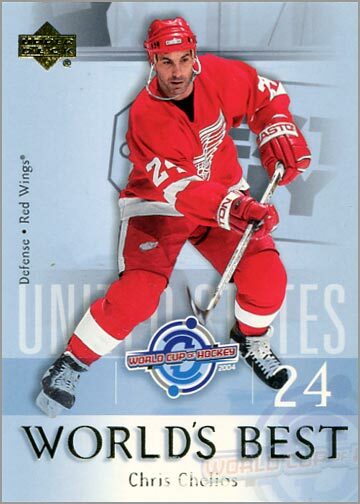 The United States won silver, and Chelios was named to the tournament’s All-Star Team. 2001-02 (continued) – Chelios would continue to have an amazing season. At 40 years of age, he led the NHL in plus/minus with a +40 rating. He was named a First Team All-Star. 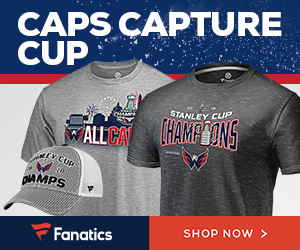 And he won his 2nd Stanley Cup Championship. 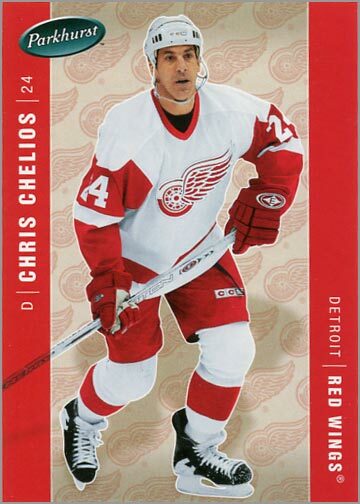 2002-03 – Chelios’ 20th year in the NHL. Despite several injuries, he played in 66 games. 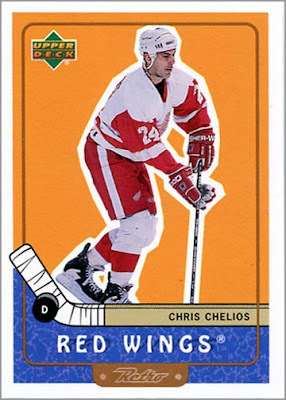 2003-04 – More injuries would limit Chelios, but he still played in 69 games. 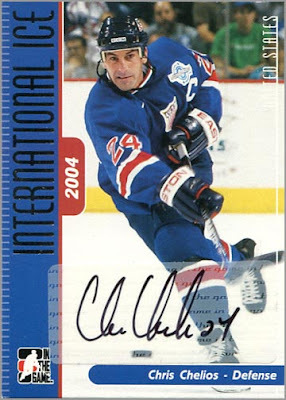 Summer 2004 – Chelios captained Team USA in the World Cup of Hockey tournament. 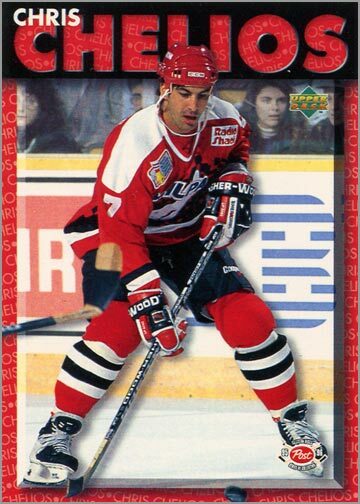 2004-05 – During the NHL lockout, Chelios played for the Motor City Mechanics of the United Hockey League. 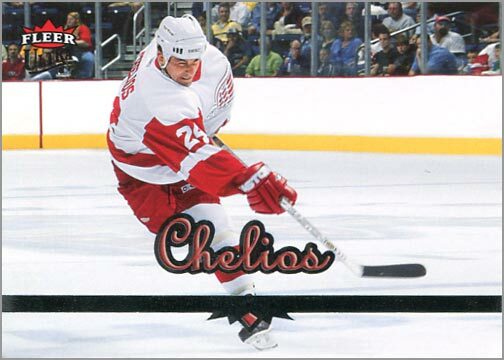 2005-06 – Chelios played in 81 games in the 2005-06 season. 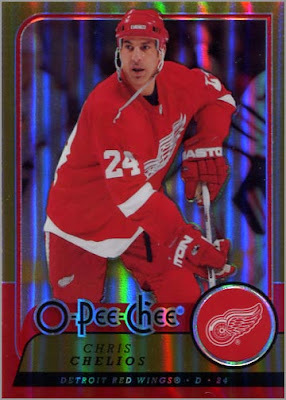 At 43 years of age, he was one of the more aggressive players on the team, leading the Red Wings with 108 penalty minutes. 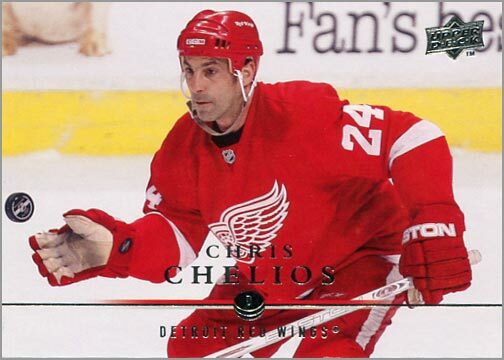 2006 Winter Olympics – Chelios played in his 4th Winter Olympics. For the third time, he captained Team USA. 2006-07 – Chelios won the Mark Messier Leadership Award for both his on-ice leadership and his off-ice charitable activities. He is the first-ever person to win this award. He also became the oldest defenseman to score a short-handed goal. 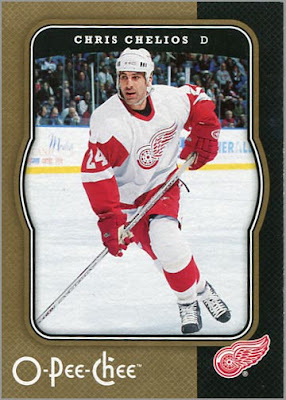 2007-08 – At 45 years of age, Chelios became the second-oldest person to play in an NHL game. 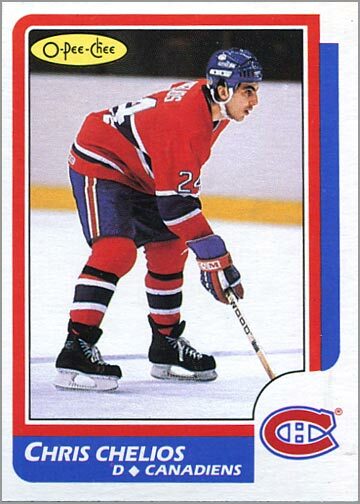 He also broke the record for most playoff games played when he skated in his 248th postseason contest. 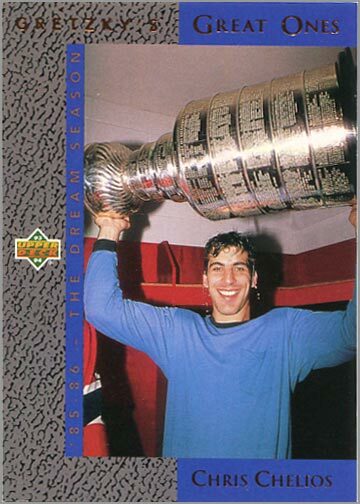 That season, the Red Wings won the Stanley Cup–Chelios’s 3rd championship. 2008-09 – In his last year with the Red Wings, Chelios saw limited action and was sent to the minors for the first time in his career. He played 2 games for the Grand Rapids Griffins. 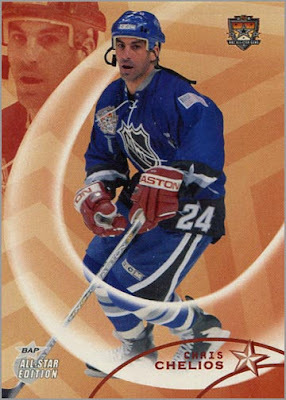 That made him the oldest player (46) in the history of the American Hockey League. 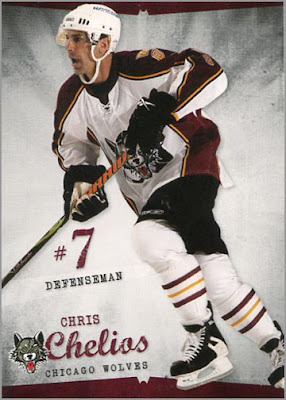 2009-10 – Chelios signs with the Chicago Wolves of the AHL. For the first time in over a decade, he plays hockey for a Chicago team, albeit in the minor leagues. 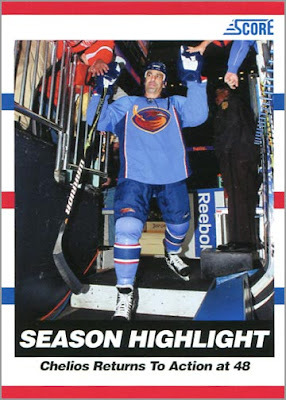 Later in the season, he signs a 2-way contract with the Atlanta Thrashers. He goes scoreless in 7 games, and the Thrashers miss the playoffs. Chelios then finishes the season with the Chicago Wolves. August 31, 2010 – After a 27-year pro career, Chris Chelios retires and is named Executive Adviser to the General Manager for the Detroit Red Wings. Chelios probably would have liked to have played another season or two. But looking at his accomplishments, surely he does not have any regrets, and will be a lock to make the Hall of Fame when he first becomes eligible in 2013. 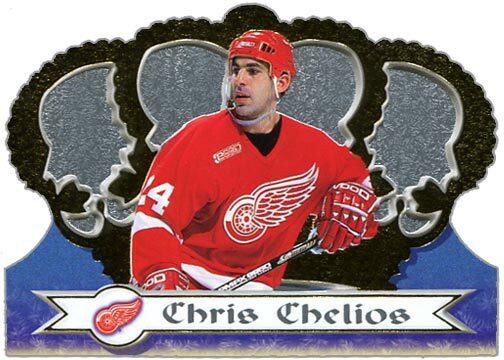 Does Chelios have a card as a Thrasher or just the highlight card? 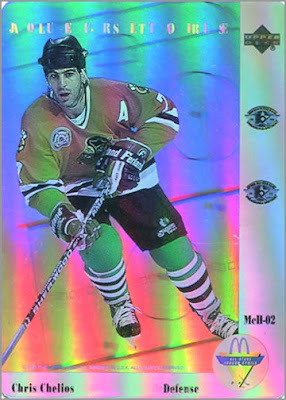 Also: I need to find me a Chelios Wolves card. The Chelios Wolves card came in a team set that was limited to 5,000. 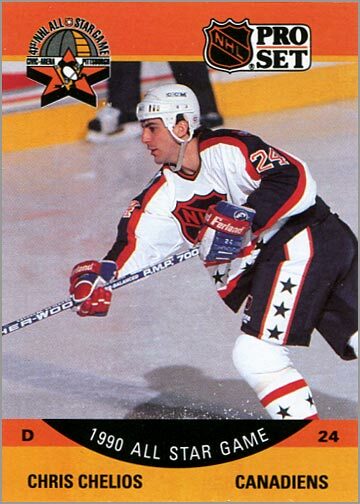 Not sure about Thrashers cards, though. He's not in Victory or Upper Deck Series 1. The Highlight card is the only Score card he is on. 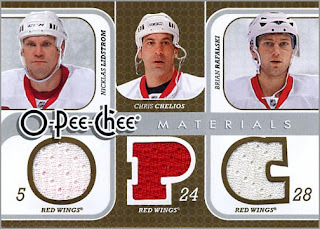 That was an amazing post… I've always admired Chelios… but I'm considering starting a small Chelios PC after reading this. Hockey @ 48? That's just crazy. 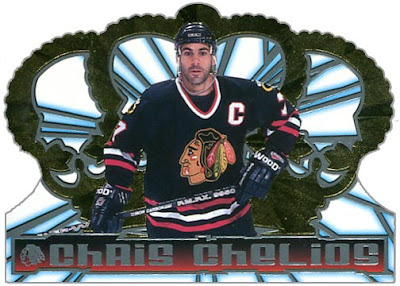 I will send you some Chelios cards. I'm pretty sure I have your address from a previous contest or giveaway. 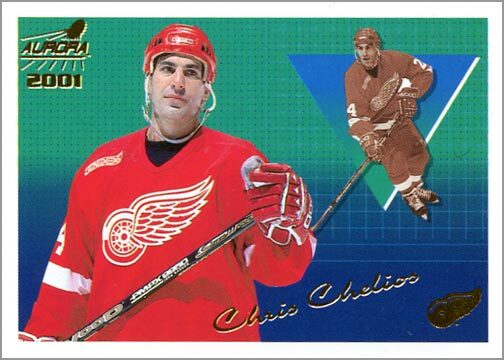 I've accumulated many doubles of Chelios cards by accidentally buying the same card twice. Happens more than I care to admit. This is the first time I read your blog. 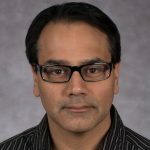 "Career in Cards" is a very good idea and definitely adds the value of base cards. Very inspiring. Stumbled upon this. Great read. Thanks!